At this point you may be under the impression that I eat really well. Let’s clear that up right now. I do try to eat reasonably and responsibly, but deep down inside I am a baker. A dessert fiend. And sometimes I may hurt you if you are between me and a piece of chocolate. Whew, confessions are good for the soul. Glad we got that out of the way. Pinterest is quickly becoming the best way to gauge emerging food trends, at least in the home kitchen. Think “cake balls” or “kale chips.” And at Christmas, I went to the grocery store all geared up to make this cute little treat I’d seen online. As I searched the candy aisle, the one thing I needed was missing. Rolos. Then it occurred to me, all those recipes I’d seen. Rolos melted atop a pretzel (my choice) or Rolos rolled inside a sugar cookie. In a weird Rolo shortage, I blame Pinterest. It’s the likely culprit. A few months ago I started to see a rash of recipes for something I’d never heard of: poke cake. Perhaps it’s truly a resurrection of an old, possibly southern, recipe. Or maybe it’s something someone made up last week. Either way, poke cakes are trendy. So I tried my hand at it. The traditional recipe involves making a cake using a boxed mix, then making a batch of boxed pudding. With the back of a wooden spoon, you poke holes in the cake, pour over the pudding and let it settle in the holes. Yum. Well, I don’t love the idea of boxed cake mixes. Really, you can make cake from scratch in less than 10 minutes. Same with homemade pudding. I know it sounds daunting, and those prepackaged mixes just appeal to our need for convenience. But homemade tastes better and you know exactly what you put into it. You’ll find a recipe for every flavor combination of poke cake you can think of, but I took inspiration from that favorite of spring southern desserts: banana pudding. In a medium pot, stir together the sugar, cornstarch and salt until well combined. 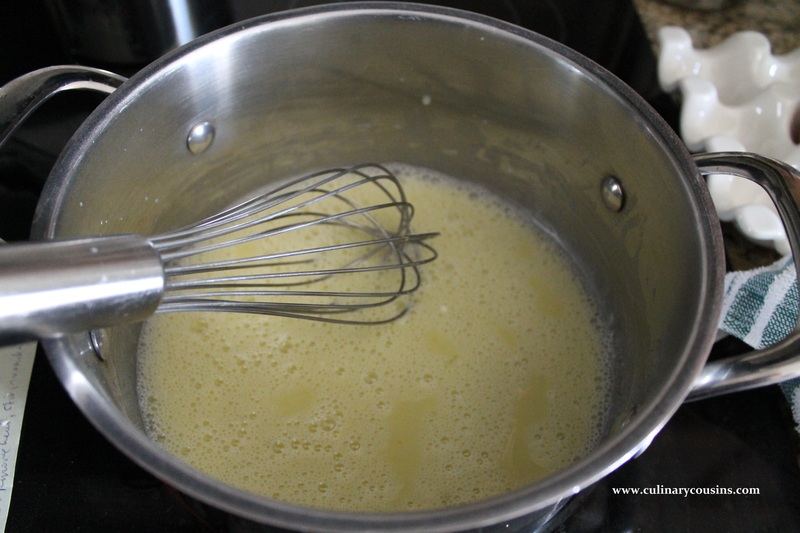 Separate the egg yolks from the whites and combine the yolks with the milk. Whisk or stir vigorously with a fork to combine. Place the pot over medium heat. A little at a time, add the entire milk mixture to the dry ingredients, whisking constantly. Continue whisking or stirring until it just comes to a boil. Cook for 3 to 5 minutes, until it thickens. You’ll know it’s ready when you can dip the back of the spoon in the pudding, carefully(!!) run your finger through it and your finger mark stays. Take the pudding off the heat. Stir in the butter and vanilla*. Pour the pudding into a glass, heat safe bowl. You could also strain it through a wire mesh strainer if you want to make sure you catch any cooked eggy bits. Cover it with plastic wrap, making sure to settle the wrap right over the surface of the pudding. That’s so, when it cools, it won’t form that icky, dry “pudding skin.” Let it cool on the counter, and then refrigerate for at least an hour. Note: you could portion out the dry ingredients — the flour, sugar and baking powder — and store them for future use, just as you would a cake mix. Turn the oven to 350°F. Grease or butter a 13×9 baking dish. Mix the flour, sugar and baking powder in a large bowl. Add the remaining ingredients. Using an electric mixer, mix everything together until just combined. Then beat on high speed for 2 minutes. Pour the batter into your baking dish and bake for 35-40 minutes, until a toothpick or knife inserted in the center comes out clean. Set aside to cool completely. With the handle of a wooden spoon, or similar utensil, poke holes all over the cake. Pour about a cup of the pudding on top, and use a spatula spread it around the surface of the cake, pushing it into the holes. When the holes are filled, you can add the remaining pudding or reserve as much as you’d like. I went for the whole shebang and had a nice layer of pudding on top of the cake. Meanwhile, whip the cream and powdered sugar in a bowl until it turns into whipped cream. It should have “stiff peaks,” meaning it holds its shape when you dip the beaters into it or it doesn’t slide out if you hold the bowl upside down. Your call as to how daring you are in trying that. Peel the bananas and slice them thinly. Place the banana slices in a layer over the pudding. Spread the whipped cream over the bananas, carefully icing it like a cake. Then sprinkle over the crushed wafer crumbs. Ha! I just got them in NYC. Love them too, so fun. I love how simple this pudding poke cake is. Thank you for this – from scratch is always better! I agree. I was so happy to find one from scratch recipe among a sea of boxed cake/pudding options. Just made this with my 4 year old daughter. Its simplicity made it fantastic for an early baker! Oh and its quite tastylicious! Thanks. I have never seen a pudding recipe without flour. I had to double check to make sure it was right. This pudding was so easy to make AND yummy. Thank you for posting this. I was looking a recipe exactly like this and I found it. Thanks!